Here's another CAS#23 challenge card that was inspired by Art.com. As I said in my last post, this site is full of inspiration! **Sorry about the poor quality of this photo. It was so difficult to get a good shot and I finally just gave up trying. I chose this fun piece as my inspiration, Jerry by Kate Mawdsley. I used a technique called Reverse Masking. I made a frame with the opening just larger than the giraffe image. I laid the frame over my Whisper White card base. I lightly sponged on a little Crushed Curry and then Dusty Durango. The two colors give the area a little depth. Then, I removed the frame. The giraffe image is from the set, Animal Crackers. I stamped him in Close To Cocoa on Very Vanilla. I colored him in with Barely Banana, Close To Cocoa, Summer Sun, and Soft Suede markers. Cut out the image using very sharp paper snips and adhered him to the card base. 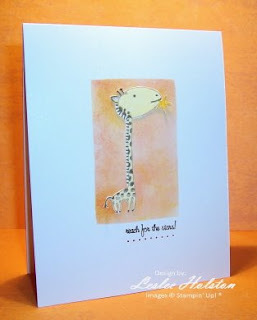 Using the Stamp-A-Ma-Jig (which I seem to be using often lately), I stamped the sentiment by markering only it and omitting the giraffe on the stamp. It wasn't my original intention to paper pierce under the sentiment. It is actually covering over a stray dot of ink. The dot was so small...but I noticed it and it bothered me. To punch out the sentiment and cover over the mistake just didn't look right. I wanted to keep the look of the inspiration piece. That's how I ended up with the piercing. It works!! What mistake?? I think that I may try using other images with this same reverse masking framed technique. It took me less than ten minutes to complete this card...more like five! How do you like it? Thanks for coming by today. I encourage you to browse Art.com. You might just be inspired to create a lovely piece of art yourself!